Home > Profile Articles > We are looking for Upskilling initiatives! 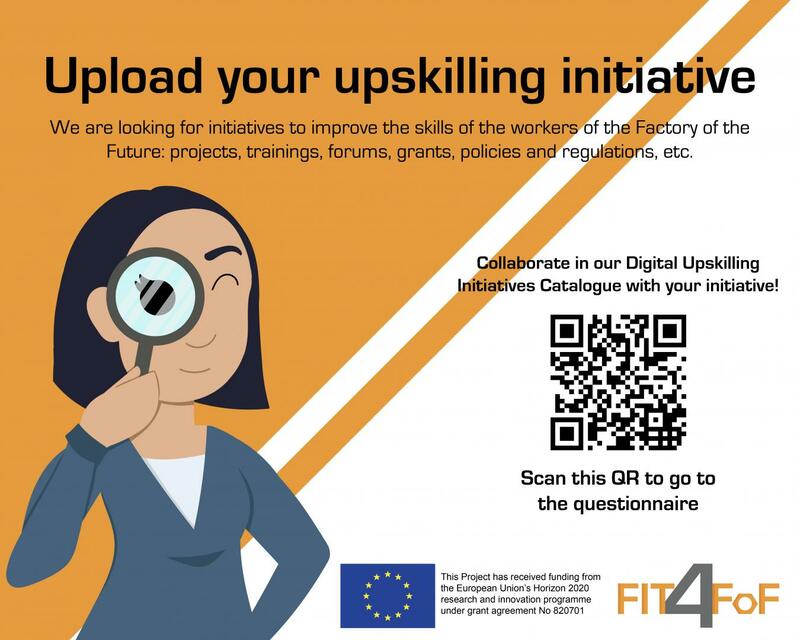 The FIT4FoF project, acronym of “Making our Workforce Fit for the Factory of the Future”, as part of the European Horizon 2020 programme, has as main objective to identify new professional skills of the Factory 4.0. This initiative is formed by a consortium of 9 partners from 8 european countries: Ireland, Spain, Portugal, Germany, Romania, France, Denmark and Italy. In order to achieve its objective, four pilots will be developed with the aim to validate educational and training approaches, moreover, the Communities of Practice will be stablished to create a community and share knowledge, best practices and skills and, finally, an Upskilling Initiative Catalogue will be created. This Digital Upskilling Initiatives Catalogue will be used to look for initiatives that improves the skills of the workers of the Factory of the Future. Anyone can access to it through the project’s website (www.fit4fof.eu/catalogue/new) and anyone can upload its initiative, that lately would be validated by one of the partners. Initiatives required are like forums, grants and scholarships, policies and regulations, projects, training (courses, programmes or training plans) that could be related to, for example, naval sector, automotive, technological, quimical, medical-technological, etc. The aim of this Catalogue is to identify the best upskilling initiatives in Europe and to make them known, as well as to share good practices.The best will be awarded as the best European upskilling initiatives in the final event of the project. If your initiative meets the requirements, collaborate with the FIT4FoF community!